The portable digital thermometer with humidity gauge not only offers convenience of indoor daily temperature and humidity checking with wide measuring range (0-60'C of temperature & 10%-99% of humidity) but also brings reliable and accurate measurement with resolution up to 0.1'C(temperature)/1%(humidity).Furthermore, it displays high/low temperature & humidity records within a day, enables you to compare the current readings to those of the past. 'C/'F units is switchable. -Daily Highest/Lowest Records - Highest/lowest temperature & humidity records will be displayed within 24 hours when it's powered on. ▲ To avoid permanent damage, please take note of the battery polarity before inserting the batteries. ▲ Change Celsius/Fahrenheit unit first (the default is Celsius) before installing the batteries. ▲ Please disassemble the batteries first to switch unit if the device is working. 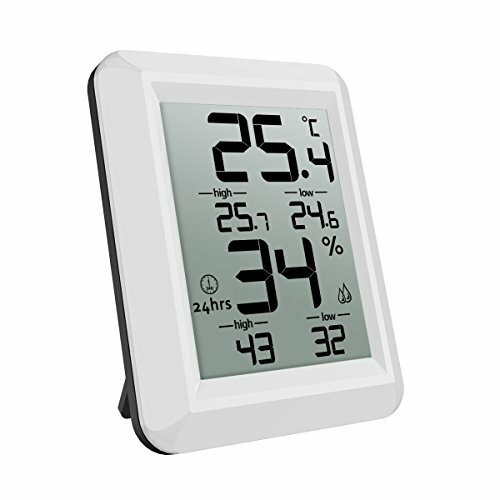 【Temperature & Humidity Combination】- The digital hygrometer thermometer displays indoor temperature and humidity simultaneously, enables you to check daily temperature and humidity effortlessly. Besides, it supports Celsius and Fahrenheit units (switch temperature units before installing batteries). 【Highest & Lowest Recording】 - Highest/lowest temperature & humidity records will be displayed within 24 hours when it's powered on. Easy to check subtle temperature or humidity changes daily. 【High Reliability & Accuracy】 - Offers precise measurement and wide measuring range (temperature range: 0-60'C & humidity range: 10%-99%). Accuracy of temperature & humidity measuring is up to ± 1'C and ± 5% respectively. Auto clear off measuring data after 24 hours. 【Large LCD Screen & Easy Read】 - Super large LCD display screen indoor humidity monitor wide field of view, convenient for you to read in different angle or sight, providing you the instant and current temperature accurately. 【Various Mounting Options】 - This humidity gauge with magnet attaching, table standing, and wall hanging design, convenient mounting feature for every type of room like greenhouse basement babyroom guitar room.